Securing your bike properly. 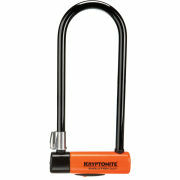 Tough cycle lock for moderate to high crime areas, 14 mm case-hardened Kryptonium steel shackle with drill resistant flat key locking mechanism and an ovalised reinforced barrel. Gold Sold Secure standard Key Features: Bicycle security for moderate to high crime areas, with a standard length shackle. 14 mm hardened Kryptonium steel shackle. Patented double deadbolt locking mechanism for extensive holding power. High security ovalised cylinder that makes this a sold secure gold lock. Reinforced sleeve over crossbar and cylinder provides enhanced security protection. Reinforced internal housing increases twisting leverage type attacks. Offset key location and overhead cam locking mechanism resists leverage attacks. Double deadbolt locking for extra strength against leverage attacks. Anti-Rattle bumpers keeps the shackle snug against the crossbar and prevent unnecessary noise. 3 keys, including 1 lighted. EZ-Mount bracket included. Rotating dustcover over cylinder protects from dirt & grime. Vinyl coated and weatherproof.